So, you're selling your home. 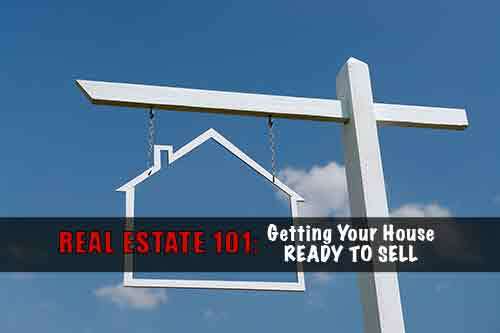 Are you wondering how to get your house ready to sell? This checklist considers all the big and small details that really matter. Your house is finally on the market! Once you've taken care of all the paperwork and set up the right real estate listings, you need to get your house ready to sell. This means you have to prepare yourself for some hard work. Take a look at this ultimate checklist to learn how to get your house ready to sell. Your goal is to show off the house, not everything you've put inside over the years. Piles of stuff in the corners, overflowing shelves, and crammed drawers will make people think there isn't a lot of space in the house. If the home can't hold all your belongings, will it be able to hold theirs? Before you start showing your house to potential buyers, spend some time decluttering each room. This is a good opportunity to get rid of things you don't need anymore or pack for your upcoming move. But don't leave boxes or extra possessions in the house. Store them somewhere offsite, either with friends or family or in a storage facility. Little repairs might not seem like a big deal, but they'll stand out to the buyers. Things like loose door handles or missing lightbulbs might make them wonder what else is wrong with the house. If they suspect there are bigger problems beneath the surface, they'll turn away. Go around the house and make sure all the little things are taken care of. This includes damaged window blinds, broken closet doors, loose shelves, sticky drawers, wobbly chairs, etc. A layer of dust on the mantle or cobwebs in the corner aren't going to impress potential buyers. You'll have to put in some effort, but your property should be spotless. Here's a quick list of chores that should go on your to-do list. The kitchen and bathrooms are the most used rooms in most households, so make sure you spend extra time cleaning these rooms. Organize the bathroom and kitchen cupboards, clean the appliances, mop the floors, hang new towels, and remove any stains from the bathtub and toilet. During your open house, keep the toilet seat closed. First impressions can either lead someone into your home or make them turn around and find another house on the market. Don't spend so much time making the interior of your house perfect that you forget about the outside. If your yard is full of dead plants or covered in a brown lawn, you need to do some landscaping. Plant colorful flowers, get a healthy green lawn, and trim overgrown trees and bushes. You might also want to give the outside of your home a fresh coat of paint. Consider painting the front door a bright color to catch people's attention. Not everyone likes pets. Some people are allergic to dogs, cats, bunnies, hamsters, rats, etc. If a person who hates snakes finds one in a bedroom, there's a good chance they'll get out of the house as fast as they can. During your open house, anything pet related, like food, toys, and beds, should be out of the house. Leave your pets with a friend for the day. Any pictures you post of your home should also be pet free. People want to imagine themselves living in a house. Your family pictures might be nice, but they'll serve as a distraction to potential buyers. Seeing your family hung over the walls will make the house feel lived in and less appealing. You should remove anything from your home that might turn someone away. Take bold artwork off the walls, store personalized and religious items out of sight, and paint the walls a neutral hue. Purple walls might look homey to you, but they might appall your visitors. Don't leave valuable items out in the house, even if you've tucked them away in a closet. Nowhere is off limits to potential buyers. They'll want to poke their heads in closets and cupboards. You don't want to risk one of those people stumbling across expensive jewelry, cash, and other valuables. Store these items somewhere off the property or lock them up in a secure safe during the open house. You can't keep your blinds closed when you're showing off your house. Natural light will make the rooms appear larger, and it'll invoke feelings of happiness and hominess for many buyers. Open all the blinds, turn on all the ceiling lights, and set up some floor and table lamps in corners or behind furniture. If you want to let in some fresh air, you can open a few of the windows. But make sure it doesn't get too cold or hot inside. You want to keep the house at a comfortable temperature. Do your best to attract buyers' attention to the best features in your home. Get rid of large rugs so you can show off the wood floor underneath. Set up necessary furniture around the house, porch, and back deck. If you're selling during the winter, turn on the fireplace. Tidy up the backyard or pool if you have one. Bring someone into your home before your open house and ask what else, in their opinion, you should change. This person should be unbiased and unfamiliar with your home. You can ask one of your neighbors to stop by if they haven't spent a lot of time in your house. While they're inside, have them do a smell test. Sometimes homeowners get so familiar with their home they don't notice if there is any kind of noticeable scent. If the person you bring into your home does notice a smell, you might need to do a deep cleaning. Candles and fresh-baked cookies are good, but they don't always mask an unusual smell. Taking the time to do these cleaning chores and make minor repairs will pay off in the long run. You want people to be attracted to your home, and inviting them in without changing a thing might not win you any interested buyers. Still trying to figure out how to get your house ready to sell? Take a look at these seven strategies that'll help you sell your home faster.